Ottawa, September 2th, 2018 – Today marks the beginning, in the federal capital, of an historic long-distance march “From Cities to Villages for the Right to Housing”, organized by the Front d’action populaire en réaménagement urbain (FRAPRU). 250 people have gathered to kick off the march of 550 km that will end in Quebec City on September 29th. This mobilization, the most ambitious in the 40 years history of FRAPRU, aims to highlight the serious denial of the right to housing that is prevalent in Quebec and Canada, to sensitize the population and to demand sufficient governments investment in order to put an end to this situation. 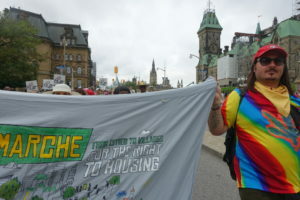 Veronique Laflamme, the FRAPRU spokesperson, called upon the Trudeau government, in front of Parliament, to formally recognize the right to housing in the bill due this Fall that will implement the Canadian Housing Strategy. FRAPRU has already spoken on this subject and denounced the lack of political will of the federal liberals. FRAPRU notably denounce that the majority of the Strategy funds allocated by Ottawa will be spent after the 2019 elections, but, more so, that no funds are reserved for social housing. “To be coherent beyond the legislation, the federal government must adequately fund social housing, as only this will guarantee and permit sustainable housing suitable to low and/or modest-income households,” states Veronique Laflamme. FRAPRU underlines that the last report of the Committee on Economic, Social and Cultural Rights of the UN deplores the lack of social housing in Canada. “Only 4% of the total housing stock is made up of social housing while 1 119 915 tenant households, 244 120 of witch are in Québec, have an urgent need of housing because they live in housing that is too expensive, too small or in bad condition. This inadequate poor housing has a direct impact on their security, their health and their ability to fully exercise their right” adds the spokesperson. “These are people that should have immediate access to adequate housing at a reasonable cost in view of their budget but there is no available housing” states Veronique Laflamme in indignation. FRAPRU also demands the long-term protection of existing social housing that currently receives financial support from the federal government. Despite election promises, the Trudeau government only committed to maintain this support until 2028. “If Ottawa does not reverse this decision and discontinues the financial support, it will translate into an exorbitant rent increase for low-income households living in existing social housing. This increase is estimated to be between $200 and $300 a month, if not more” reminds the spokesperson. Some 85 marchers will cross the Ottawa region this week. After having marched from Ottawa to Gatineau on September 2th, the march will pass through Masson-Angers on the 3rd, Thurso on the 4th, Pointe-au-Chène on the 5th and Papineau on the 6th, before making its way through the Laurentides, Laval, Montréal, Montérégie region, Lanaudière & Mauricie regions and Quebec City before ending on September 29th in front of the national assembly. On September 13th, 2018 the march will cross the Island of Montréal.